On the way to my dance lesson last night, I stopped briefly at an applicance store there. I bought the last Braun MultiToast HT-550 they had in stock. In fact, it was the one on display, so I got it for onlt 420 SEK instead of 500. I've been looking around for this particular toaster but had not been able to find a retailer in Sweden that carried it; so I was glad to find it. That I found it without making a special trip was even better. I've already toasted a few slices of bread in the new toaster, and I can confirm that it works well. Plus, it matches my black Braun hot water pot. Why were you looking for this model? Has it any special characteristic? Or it only was because you wanted it to match with the water pot? LOL! 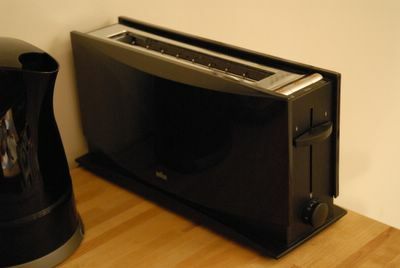 I wanted a toaster with one or two long slots so that I can toast longer pieces of bread. But I also wanted a toaster with a simple design, and with no colors other than black, gray, or white. Finally, I wanted a toaster with mostly rectangular corners, not a curvaceous beast that takes up too much space. So this one meets my design specifications quite nicely. My one complaint is that the plastic is glossy and rather soft. I would prefer a higher density plastic with a matte finish. I think this would make the appliance look a bit more professional and feel more solid.